A Lot Grading Plan (Surface Drainage Plan) has been a part of the approval process for commercial and multi-family properties since 1993. The plan is required for new developments and approved by the City of Edmonton, Development Services on behalf of City Council. This plan specifies design elevations, surface gradients, swale locations, and other drainage information required for lot grading. The approval of this plan provides an effective basis for lot grading control which will establish the drainage relationship between abutting properties. The example drawings of Lot Grading Plans for multi-family, typical commercial, and shopping centre provide general information of what should be shown on the plan (for reference only). Upon application for a development permit for any land zoned Commercial, Industrial, Multi-family, Apartment, Row Housing, and Urban Services, the developer has to submit a proposed Lot Grading Plan to Development Services, Lot Grading for approval. This plan must be completed within 60 days of the issuance of the building permit. 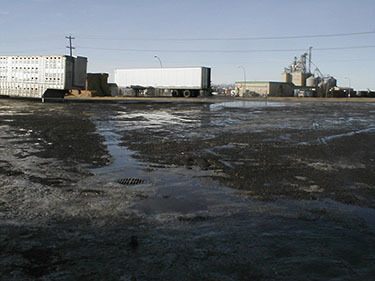 City of Edmonton, Development Services will send a letter to the applicant after reviewing the proposed Lot Grading Plan, notifying the applicant whether the plan is approved or needs revision. The applicant is responsible for revising and re-submitting the Lot Grading Plan for further review within 60 days. Once the proposed Lot Grading Plan is approved, it will be stamped and signed and returned to the applicant for site construction. If changes to the approved Lot Grading Plan are required, a revised drawing (red-line revision) must be sent to City of Edmonton, Development Services along with the written consent of the affected property owners for review and approval. Once approved, this revised Lot Grading Plan will replace the previously approved one.